Scouts is the third section in Scouting, and is for boys and girls aged 10½ to 14. You do not have to have been a Cub to join Scouts, just keen to join the adventure. Scouts take part in a wide range of activities as part of their programme, such as archery, geocaching, volunteering and expeditions. Being outdoors is really important to Scouts and provides an opportunity to learn new skills, such as backwoods cooking, bushcraft, pioneering, hiking and survival as well as the wide range of adventurous activities, from abseiling to yachting. There are many awards that Scouts can work towards, completing challenges to earn the Chief Scout’s Gold and Platinum Awards. Scouts can work towards their Duke of Edinburgh Awards at the same time or pursue international awards with lots of opportunities to travel with Scouts from their own troop and others from across the District/County. Whether you choose to work towards an award or not, taking part and having fun is just as important as what you achieve as a Scout. This year youth shaped scouting is especially important as our new Youth Commissioners find out what scouts want to be doing and how scouting can grow to be more diverse and more inclusive. 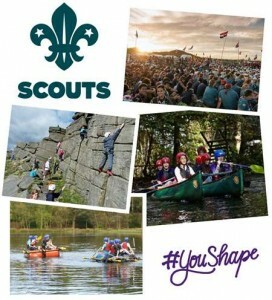 Join the conversation #YouShape. Whatever you do in scouting you will make great friends and be part of a great adventure.